The idea of the Innovation & Learning Center (ILC) began when LCRI Executive Director Jim Walls happened to run into Superintendent of School District #7 at the time Sean Gallagher. Jim shared that he was searching for a local venue to host renewable energy workshops, bringing in outside communities to learn from Lake County’s efforts in using renewable energy as an economic development tool. Sean pointed to the Daly Middle School, a town-treasured historical building that had been vacant for many years and asked if Jim had heard about Governor Kitzhaber’s 40-40-20 goal. The 40-40-20 goal is that by 2025 all adult Oregonians will hold a high school diploma or equivalent, 40% will have an associateâs degree or a meaningful postsecondary certificate, and 40% will hold a bachelor’s or advanced degree. This conversation generated some big ideas. The idea of LCRI providing education to other communities on how to use renewable energy as an economic development strategy and providing teachers with continuing education opportunities in forest ecology has grown to a vision of having an accredited higher education institution at the Daly Middle School. On February 29, 2012 Lake County Cooperative Extension advisor Pete Schrader and School District Superintendent Sean Gallagher called together representatives from Lake County School District #7, Paisley School District, Oregon Institute of Technology, Oregon State University, Treasure Valley Community College, South Central Oregon Economic Development District, LCRI, Lake County Chamber, and the Town of Lakeview to discuss the idea of an innovation and learning center. In just a short time School District #7, Lake County Commissioners and Klamath Community College (KCC) signed an MOU for KCC to serve Lake County. KCC is also working on an agreement with Oregon State University (OSU) to offer a 4-year degree in agriculture at KCC both in Klamath Falls and Lakeview. Develop future leaders and community vitality as a whole. Collaboration between local public K-12 school districts, multiple higher education institutions and local major employers will help to generate educational opportunities that meet the needs of the community and region at-large. Educational opportunities can be incorporated into job opportunities that strengthen regional economies and help provide job creation. It is also envisioned that the Paisley School District #11 which has a dormitory would allow the Center to offer teachers and foresters continuing education in forest ecology and forest monitoring. The dormitory is used to house foreign students attending high school in Paisley and is vacant during the summer months. Lake County Resources Initiative (LCRI) runs a local forest monitoring crew during the summer and would offer continuing education with in the field experience. This project could become a model for Governor Kitzhaber’s 40-40-20 plan for Oregon education. On March 12, 2013 Governor Kitzhaber made this project an Oregon’s Solution project (see Publications for the Governor’s letter). Also in Publications on this website is a copy of what has been accomplished to-date and main talking points about the center. Students take Music 206 at the Innovation & Learning Center in Lakeview, OR. A college-level course taught at Klamath Community College. 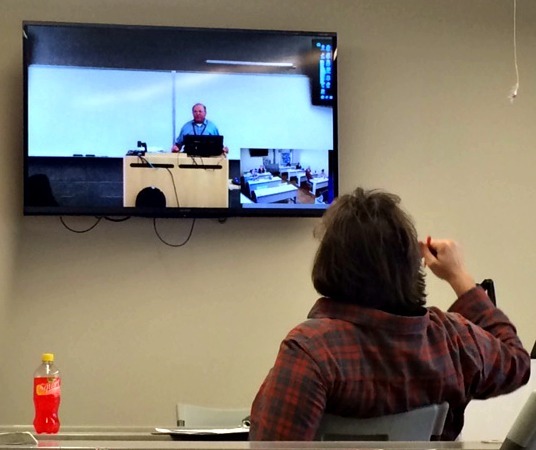 The ILC is already offering Klamath Community College (KCC) courses via synchronous video technology in Lakeview. In it’s first operating semester of Fall 2013, KCC-Lake County students (synchronous, in-person, online) earned a total of 310 credits and in Fall 2014, students earned 472 credits. The demand for local technical training and post-secondary education is increasing here in Lake County. The ILC offers dual-credit opportunity for high school students looking to get a jumpstart on their college education. 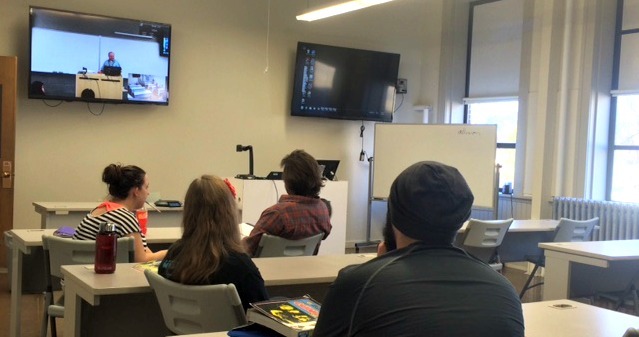 With the distance learning technology provided at the ILC, students in Lakeview can interact with their professors in Klamath Falls, OR. During the seismic renovations it was discovered that there was once a stage in the top floor of the Daly Middle School, and we think there should be one there again. We are in the process of fundraising to renovate the space. This large space will be transformed into a Community and Cultural Center and will be used by the community to hold plays, reunions, concerts, cultural events, conventions, etc, the possibilities are endless. To help this process, please consider donating to LCRI via the pay pal account below. With its high ceilings and large space, this could be a wonderful auditorium to be utilized by many community groups and events.